M38A1 Axe with handle. These are the special short handled axes which were specifically used in the M38A1 only. They are not readily avail. AJP exclusive. Decal Set M38. 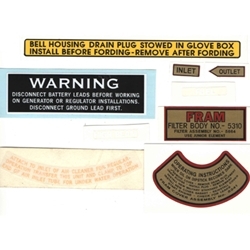 This set includes the following: Battery disconnect, pre cleaner, Fram oil filter canister set, fording plug, high beam & fuel (hard to see).